Autumn in the Northeast is a beautiful time of year when the leaves on our trees glow with brilliant reds, yellows, and oranges. Now, as we've said before, though coordinating and found together in nature, these hues can sometimes seem a little juvenile or hokey when put together as part of your decor. Sometimes the easiest way to gear up for Fall is to think "rustic". 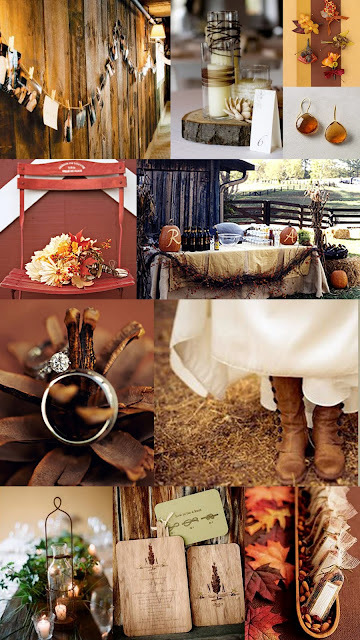 Although rustic details are actually beautiful any time of year, they are particularly heartwarming in the fall. Maybe it's because fall brings about a renewed connection with nature for many people or maybe it's because the smell of fall reminds us how much we love to layer, but whatever it is there is really nothing like the cozy and comfortable feeling of a rustic fall wedding. Lucky for you, rustic details are easy! Add a few loose flowers or candles to a mason jar, utilize branches and leaves, keep stationary simple, and add down home touches like pies or jam and you'll be all set! Fall Style: Coat and Jackets and Shawls, Oh My!